If you're traveling, it's probably because you want something different. Whether you want to travel forever or for an upcoming holiday, you want to experience something that your current situation isn’t providing. And, Thailand is probably different than what you’re used to. Sure, there are temples and monuments and national parks and islands to experience, all of which are awesome. But none of those are quite as authentic and raw as night markets. 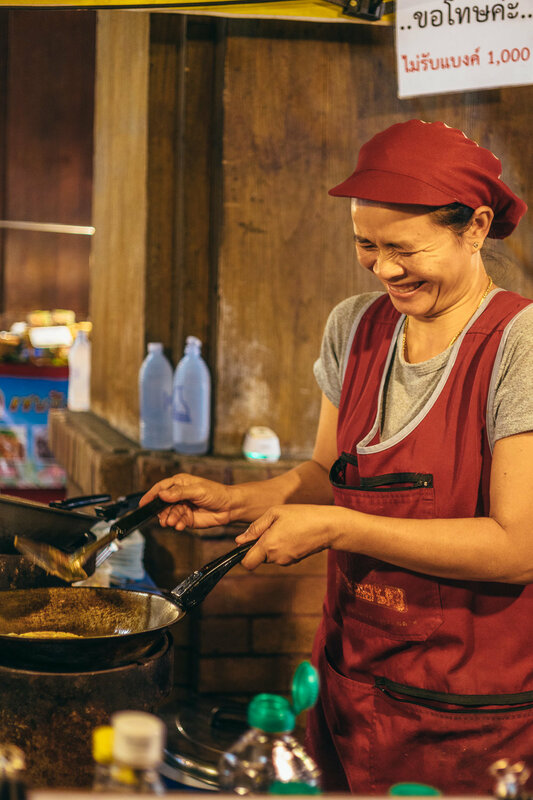 Night markets provide that sense of immersion and culture that little else can provide – the cacophonous sound of multilingual chatter and laughter, squeaky cars and rumbling motor bikes, and the blending of music far and near. Then there's the smoky aroma of meals being prepared (i.e. fried), both salty and sweet, and the clash of vibrant, saturated colors, from store-front signs and lamps to fruits and desserts. It’s all very exotic. And different. During our two months in Chiang Mai, we visited quite a few markets quite a few times. Here are the ones you should visit. Note: For a map of where all the markets are located, scroll all the way to the bottom! The Sunday Night Market, aka "Walking Street," is located in front of the highly revered Wat Phra Singh on the west side and runs along Ratchadamnoen Road. The market is only open on Sundays, from 4 PM to 12 AM. So, about the Sunday Night Market: You either like crowds, or you don’t. If you don’t, this market will test your patience. This is by far the largest night market we visited, and also the most populated – we walked for hours, got lost a few times, and still never really found the end of the market. Although the market is mainly along Ratchadamnoen Road, it extends in a seemingly endless fashion along adjacent streets. Similarly endless is the selection of foods and goods here – food stands galore at cheap street prices, along with stands selling flowers, fried insects (thanksbutnothanks), handbags, paintings, etc. This market has it all, including the remarkable mango sticky rice we had first found at Central Kad Suan Kaew Market (further down the list!). As you'll find, many stands also open up at different markets on different days. If you could only visit one night market, and you don’t mind crowds, this one is the one I would suggest. Although I wouldn’t necessarily visit again because of how exhausting it was, I recommend it simply because of how varied and enormous the market is – if there’s something you want to find, chances are you’ll find it here. Just make sure you visit with enough time. 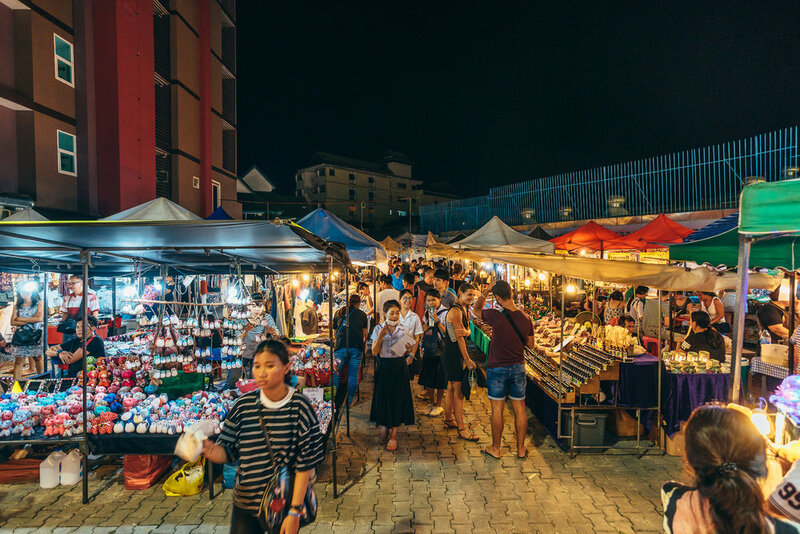 The Saturday Night Market is located on Wua Lai Road to the south of the Old City and is open from 5 PM to 10 PM; it’s within walking distance of the Tha Pae Gate. When we visited this market, it was fairly congested – the small size of the market and the large crowds didn’t mix well. Still, this is what night markets are all about, and I tend to like the transient energy of it all. There were a few separate food courts established, each with their own variety of meals (sushi, fried meats, Thai cuisine, etc. ), and one of which even had Linkin Park playing at the entrance (automatic win). There were a few stalls selling instruments, including guitars, ukuleles, and ocarinas, along with other stalls selling textiles and hand-made goods. While our visit was short-lived, we did notice something that you definitely don’t see everyday: a dessert that was NSFW. According to the booth, it was just a rocket waffle. OK. The Kalare Night Bazaar, Anusarn Market, and Chiang Mai Night Bazaar are open everyday till 12 AM, and are all located between Chang Klang Road and Tha Phae Road. They aren’t easy to miss, as their entrances have large signs pointing them out. While all of these markets are extremely similar given their proximity (calmer atmosphere, spacious inside markets, cramped outside markets), they each have a differentiating factor or two. Take Kalare Night Bazaar, for example, which had ample space for its indoor markets, and a covered food market labeled “Food Center." Although this food market had plenty of meal options available (different flavors and ethnicities), abundant seating options, and a vaulted ceiling covering it all, we found it to be slightly overpriced and not to taste better than the other food markets on this list. Then the Anusarn Market. At this market, you’ll find a few restaurants and bars alongside many stalls. Plus, of course, you’ll find the bar that contains the Chiang Mai Cabaret Show (9:30 PM and 11:00 PM every night), an overall interesting cultural experience for sure. Finally, the Chiang Mai Night Bazaar, which had quite a few booths and stores for handmade goods, but not many food stalls. Furthermore, we noticed a small-production cultural show taking place within the Bazaar that in our case was an entrancing Thai dance fused with an intimate acoustic-guitar performance. Overall, this entire bazaar and night market area is an entertaining and captivating experience for an evening out. We found this market to be up and running from Thursday to Saturday, 5 PM to 10 PM. The market is pretty small and you could miss it if you were just driving by and didn’t know what you were looking for. This was one of our first night market stops, and we weren’t disappointed. This night market, as the name would suggest, is located in front of the Central Kad Suan Kaew and is near the start of Huay Kaew Road (next to the Old City, on the northeast). The Central Kad Suan Kaew market is one of the smallest and least-crowded markets that we visited; it also ended up being one of our favorites (more on that later). The main attraction of this night market was food – it’s all that was being sold. Thai food was on the menu, expertly-prepared and perfectly-priced. Plus, we also noted the usual and colorful assortments of sushi, fruits, drinks and smoothies, and desserts sprinkled throughout. Something we loved here more than any other market was the mango sticky rice, which was served with white, blue, and green rice. For those curious, the blue rice is prepared with dried butterfly pea flower petals, and the green with pandan leaves! We'll have an entire article on mango sticky rice coming up soon – be on the lookout! The Suandok Park Night Market is located right in front of Suandok park, which is an outdoor shopping mall/hang-out area. The market keeps the strange schedule of only being open on Mondays and Tuesdays, and generally till 9:30 PM. This is the market we frequented most due to its proximity to the apartments we were staying at in Chiang Mai. In comparison to all the others, this market is the smallest and has the most charm, so to speak. It has a rather small selection of food and goods (about a stall or two for clothing, phone cases, and so forth), but has ample seating area considering its size. More than anything, the great tasting food kept us coming back for our weekly street dinners. Because of the small size of this market, we noticed that by getting there near closing time, we unintentionally ended up with tons of extra food that kind stall owners gave us before closing. Warorot Market can be found sitting between the Ping River and the Old City on the east side, just to the north of the Kalare Night Bazaar. The official hours of the market are from 5 AM to 6 PM, but there are markets that stay open on the outside well past that time (till about 11 PM). Locals here refer to this market as Kad Luang, which stands for “Big Market.” It is one of Chiang Mai’s most popular landmarks for both tourists and locals, with a 3-story indoor component and a surrounding outdoor area teeming with shops and stalls. In addition, it is a regular market during the day (which I highly recommend you visit!) and a night market on the outside after the sun sets. Warorot is in the center of what is essentially Chiang’s Mai’s Chinatown and contains a wide-ranging assortment of clothes, bags, food (cooked or pre-packaged), and other goods. Warorot has a very unique look and feel to it, which was one of the main reasons we included it on this list, given that the inside closes early and hence isn’t technically a night market. Extra tip! : To the north and south of the Old City square, we always saw stalls and small markets open every day of the week. We never stopped at any of them, but they looked authentic and fun! Check them out if you have the time!